" Be nice to the bus driver. It's a long walk home from school. " The need for safe transit of each child to school and back home is of prime importance to us. 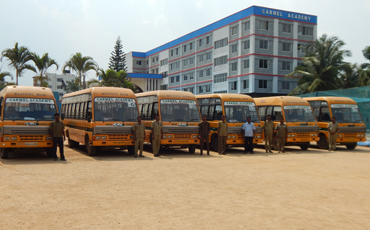 To ensure safe travel, Carmel Academy has its own fleet of school buses designed as per standards and manned by trained drivers and personnel sensitized to the needs of small children. 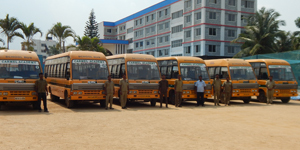 We have 11 buses to facilitate children for pick up and drop at their scheduled bus-stops. These buses are equipped with trained, certified and experienced drivers, women personnel, installation of cameras for the safety of the children and a First-aid kit in each bus for any unforeseen emergency. All the related issues with regard to the school transport facility are managed by an efficient transport head in-charge.